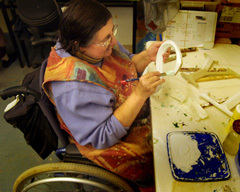 THE SIGNS you design and order from our website are handcrafted by an award winning team of signcrafters and artists. Many of our current staff members are family and friends of the original craftsmen - and they carry on the original vision. 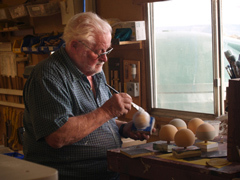 At Danthonia old and young work together in an environment where traditional work values and hand-skills are passed on to the next generation. We share our responsibilities in such a way that every worker takes ownership and pride in keeping our quality high and our customers happy. The results speak for themselves. 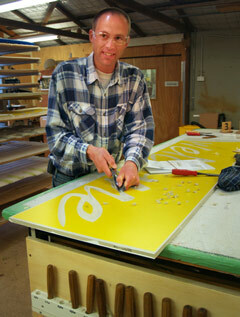 Making world class signage by hand is a rewarding experience in itself. Enthusiam is high as complex projects reach completion and we take a photo of each sign to show to our clients prior to shipping. 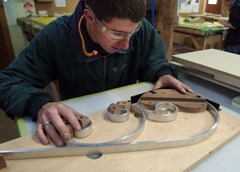 Our handcrafting methods mean unsurpassed attention to detail - but without long lead times. We approach each project as a team and are able to supply your fully handcrafted custom sign in 21 days with free delivery or in 15 days for a rush fee. After 7 years in business Danthonia Designs was awarded a first place Industry Training and Development Award by the Australian Sign and Graphics Association. We train all of our crafts people in house. In an era where most of the sign industry has given up on historic handcrafting techniques - chisel carving, relief sculpting, gold leaf gilding, post cap turning and artisitic hand painting are alive and well here.